On March 23, 2014, water was released from the Morelos Dam on the U.S.-Mexico border, as part of the “Minute 319” agreement. Researchers studying the effects of the 105,000-acre-foot flow, using Landsat 8 and other tools, saw a resulting ’green-up’ of the lower Colorado River Delta. Dec 18, 2014 • [By Kate Ramesayer, NASA Goddard] A pulse of water released down the lower reaches of the Colorado River last spring resulted in more than a 40 percent increase in green vegetation where the water flowed, as seen by the Landsat 8 satellite. The March 2014 release of water – an experimental flow implemented under a U.S.-Mexico agreement called “Minute 319” – reversed a 13-year decline in the greenness along the delta. The year 2000 was the last time the Colorado River reached the Sea of Cortez, between Mexico’s mainland and Baja California. Since then, said Pamela Nagler of the U.S. Geological Survey’s Southwest Biological Science Center in Tucson, Arizona, information from ground measurements and satellites, including NASA/USGS’s Landsat missions and the Moderate Resolution Imaging Spectroradiometer, or MODIS, instrument on NASA’s Terra satellite, have shown a decline in the amount of healthy vegetation along the lower reaches of the river. This spring’s pulse flow brought back some of the green. Nagler and other members of the Minute 319 Science Team used Landsat 8’s sensors to track the response of plants to the pulse of water. Landsat 8 is a joint project of NASA and the U.S. Geological Survey (USGS). When they compared satellite images of pre-flow August 2013 to post-flow August 2014, the researchers calculated a 43 percent increase in green vegetation along the route wetted by the flow, called the inundation zone, and a 23 percent increase in greening of the riparian zone, or the river banks. Scientists presented these and other results this week at the American Geophysical Union’s Fall Meeting in San Francisco. “Data from Landsat and the MODIS sensor are well-suited to help people make informed policy decisions about ecosystem health, water management, agriculture and much more,” said Jim Irons, Landsat 8 project scientist at NASA’s Goddard Space Flight Center in Greenbelt, Maryland. “It’s especially gratifying to see these sensors help scientists evaluate several of those components in one project,” he said. Remote sensing data were used in studies showing the impact of other relatively small flows prior to the Minute 319 agreement, and researchers are currently using Landsat 8 and MODIS to continue studying the effects of the 2014 water release. Irons said that projects like this one demonstrate that researchers need an archive of good Earth observations of the past to refer to, as well as comparable measurements into the future to measure how a policy changes the landscape. “It’s important to have continuity of the data, so that when a policy decision is made to release the water, we have a system in place to evaluate its effects,” he said. The Minute 319 pulse flow is part of an agreement adopted by the International Boundary and Water Commission, under the framework of a 1944 U.S.- Mexico treaty that governs water allocations on the Colorado River between the two countries. The 2012 agreement prescribed 130 million cubic meters (105,000 acre feet) of water to flow through Morelos Dam, which straddles the border. 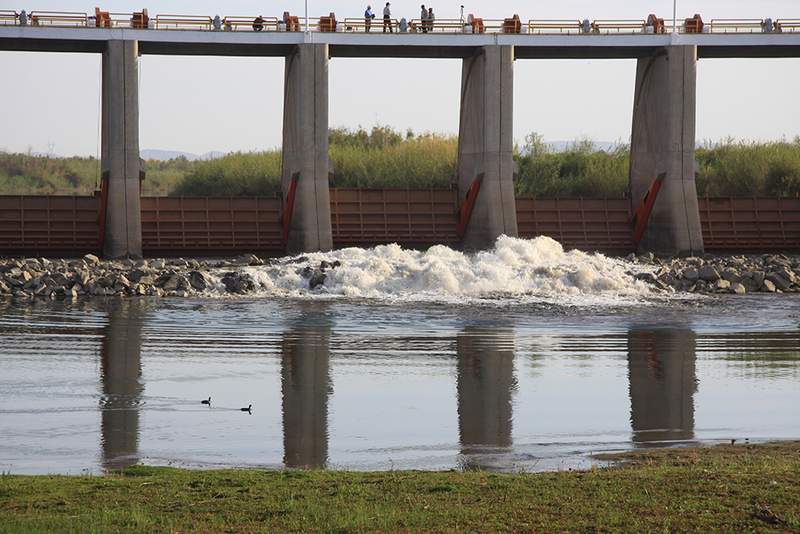 Although most of the water soaked into the ground in the 37 miles below the dam, the river’s surface flow reached areas farther downstream that had been targeted for restoration, and groundwater revived vegetation along the entire route to the sea. “Remote sensing with satellites such as Landsat and sensors such as MODIS allows scientists to conduct a range of studies they wouldn’t otherwise be able to,” said Karl Flessa, the co-chief scientist of the Minute 319 Science Team studying the hydrologic and biologic effects, and a geosciences professor at the University of Arizona in Tucson. It’s just one of the tools scientists are using, along with on-the-ground monitoring, to detect changes in the river channel, surface water, groundwater, plant growth, and habitat for resident marsh birds and migratory birds. “In addition to remote sensing, ground-based geophysical methods such as time-lapse gravity maps provide information about the change in groundwater storage, which ultimately supports riparian vegetation,” said Jeff Kennedy, USGS hydrologist and participant in the study. The Minute 319 pulse flow was the result of significant cooperation between a large group of partner organizations and agencies in the U.S. and Mexico. With so many interested parties, and water such a precious resource, scientists will continue to monitor the lower Colorado River Delta’s vegetation and hydrological response to the pulse flow, Flessa said. Using greenness data collected both from the ground and from satellites, researchers will investigate the long-term impacts to groundwater, and they’ll continue to study whether new trees and shrubs take root due to the flow. They will also study how the new vegetation affects birds migrating along the Pacific Flyway. 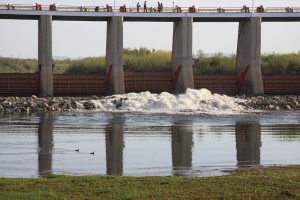 “There’s hope that we could release a pulse of water below Morelos Dam again,” Flessa said. This entry is filed under Ecosystems and Biodiversity, News, Water.